When Brandon Shea passed on Boston College to head to the Moncton Wildcats, it was hailed as a great leap forward for the QMJHL's recruitment in New England. It turns the retention part has hit a snag, to put it ever so mildly. Within the past 24 hours, Shea, the 6-foot-2, 200-pound centre from Marshfield, Mass., whom the Wildcats took with a first-round pick that cost them three draft choices to acquire (including a likely top 10 pick this June), has left the Wildcats and gone home. At this writing, his name is no longer even on the Wildcats' roster on the QMJHL website. It is not the end of the world for the promising 16-year-old, who would have this off-season to land with a new team where he can showcase his skills for the NHL draft in 2013. Shea, son of NHL scout Neil Shea, had appeared in only two 'Cats games since Feb. 1. He had three goals and 10 points in 45 games in the midst of a season where Moncton coach Danny Flynn seemed to relying heavily on older forwards such as overage Marek Hrivik and twins Alex and Allain Saulnier to scratch out points. There's a lot of theorizing at this point, but Kevin Forbes said it came down to how Shea was used. Or not used. 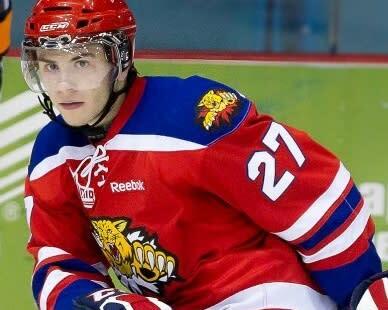 #QMJHL news: 2013 draft eligible Brandon Shea has reportedly left the Moncton Wildcats and gone home. Apparently dissatisfied with icetime. Last summer, Flynn said recruiting players of Shea's background, " ... would also be great for our league. The Eastern U.S. market is an area that as a league we're trying to make in-roads to try and get more American kids to play in our league." Whatever the reason, it didn't, and now the question becomes how to salvage it. With his NCAA option burned, Shea's best bet is likely to see if a trade can be worked over the summer. The other high-profile newcomer from south of the border, Quebec Remparts power winger Adam Erne, has had a hugely successful rookie year. Erne is third among 1995-born players in scoring with 25 goals and 52 points in 57 games, trailing only first overall pick Nathan MacKinnon of Halifax and his Quebec teammate Anthony Duclair. The differences there could be that (a) Erne arrived with more experience after spending last season in the USHL and (b) Quebec had a younger lineup. The Remparts' intention all along has been to contend without compromising the development of the players in the 1994 and '95 cohort. (Quebec has three of the league's top six rookie scorers, including Mikhail Grigorenko.) Moncton's situation might not have allowed for that, especially after they moved out star defenceman Brandon Gormley and had to play more kitty-bar-the-door to keep their heads above the water. A call to Flynn was not immediately returned. Neate Sager is a writer for Yahoo! Canada Sports. Contact him at neatesager@yahoo.ca and follow him on Twitter @neatebuzzthenet (photo: QMJHL).